8:30am - Our Nite Camp must be located in a wind corridor. There are a ton of wind generators here. Scampy was not bothered much by that wind. Perhaps remaining hooked up to Little Honda stabilized Scampy? George is still learning about backing up a trailer. Took about 10 minutes to get Scampy turned around to head out from where we are in the pic above. The dirt road from the highway to our Nite Camp has graded in bumps. Little Honda has to move slowly over such a road to keep Scampy from shaking to pieces! Baby Boid is very much disturbed by those bad bumps, and moves very close to George. Maybe for comfort support? After leaving Nite Camp, we drove down the bumpy dirt road and came to the highway. That’s when we saw the sign about Palm Springs. And, decided to head there. Since we moved to Apple Valley, we had not done a Google Map exploration for cities and towns. We looked at Google Map only to see the forests. We are surprised to find Apple Valley 90 miles from Palm Springs. This camping trip has provided us with a much clearer perspective of where we are at Lone Wolf RV Park. It was Breakfast at Denny’s this morning. Their pancakes are sooooo good! While at Denny’s, we composed our Blog using Apple Notes. We have Blogged to you about that before. We are using notes because of AT&T data cost. If we composed using Blogger, we would have to be online and using expensive data. By having our Blog all ready prepared, when we go online we copy and paste and do a little formatting. Then publish! That’s it. a 1-gallon bottle of purified water was easy to do. Water for Scampy, is a bit more tricky. Using Garmin GPS, we found a nearby park. We had to scout around the park for awhile. And then we found a hose bib with water near the restroom. We never Blogged to you about our giant hose that we bought at Home Depot. It’s extremely light weight and expands to 100 feet in length! Incredible find! We have made an Afternoon Camp at Morongo Casino. Very likely, this will become our Nite Camp as well. Morongo has a very strong Visitors Network. When we attempted to signon, a Google warning interrupted stating that the Morongo Network was not safe. “Get back to safety”, Google advised. So, that’s what we did! With our method of preparing our Blog offline using Apple Notes, we really do not need much online time anyway. Unless we wanted to mess around online to browse. PS: Where is this place? I captured the image below on November 20, 2009. Can you guess where this place is located? 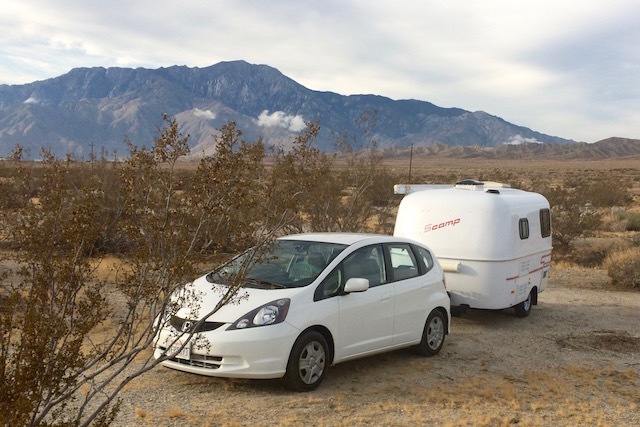 How does your Honda Fit feel while towing the Scamp on the highway? What was the total travel weight of your trailer? It looks like a nice combo. 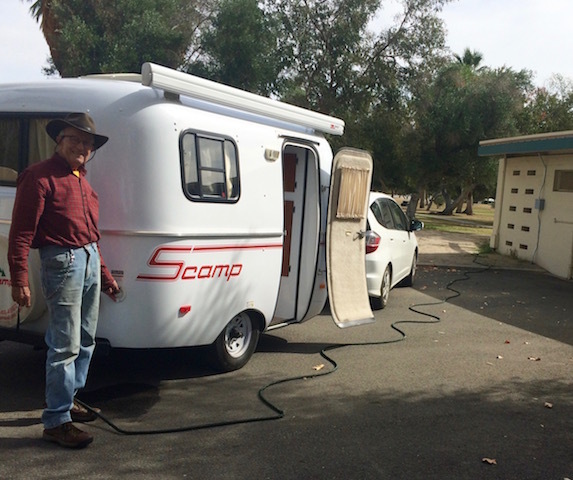 FIT tows Scampy very well. Starting and stopping, fine. Increasing velocity on grade a little weak. Does look good as a combo though. Thank you for that compliment! sounds like you're having fun. We will be leaving Vegas on Thursday heading down through AZ on our way to MX. Won't cross the border until Nov 21st though. Are you heading to Mazatlan? I miss Fat Fish! George, wouldn't it be nice if that park had a dump station, too? Then, you could offset your new fresh water weight by disposing of your old waste water weight, no matter how small. Your Honda Fit would breathe a slight sigh of relief! You may be right on with your weight thinking. You can tell by my Blogging? Don't forget that there are lots of forest service and Bureau of Land Management sites where you can camp legally for free or very, very cheaply. I do know that there are places right at the south entrance to Joshua Tree National Park for next time. Very good information! Thank you. Nice to see you and the team out on the road and in the wilds! ENJOY!!! Very nice to be "out on the road!" Morongo Indian Casino as being in the wilds. I'm definitely going to give the bottom of the steering wheel a try!